If you love the elegant, iridescent, vibrant colors found in the gorgeous plumes of peacocks, then a peacock duvet cover may be your dream bed cover. Even when you put a different spin on the colors of the instantly recognizable peacock feather or even the entire bird itself, the peacock is one of Mother Nature's most amazing and unique designs. While a peacock pattern may not be one of the most common bedding patterns you will come across, this pattern is out there if you know where to look for it. Vision Bedding is one of the best resources you will find for unique or unusual bedding patterns. This company is unlike most other bedding retailers because Vision Bedding has the ability to transfer photographs and graphic art onto bedding and other home textiles. The results are absolutely amazing. 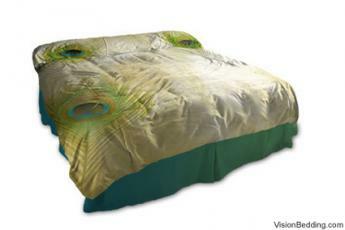 Crystal-clear images and vibrant colors make your custom bedding from this company very special. Vision Bedding has a huge gallery of designs, photographs and graphic art that can be made into any type of bedding, including peacock bed covers. When you see a pattern you like, look for the button that says 'View in a Room'. You can then see how the pattern will look as a bed cover, pillow, throw, rug or wall art. At the Bedroom Duvet Spot, you can find the Tavus Kusu Duvet Bedding Set by Arya. This beautiful design features an elegant pair of peacocks perched on a tree branch against a white background. The design is bordered by a classy damask pattern. This six piece set includes a flat sheet, two pillowcases, two pillow shams and the duvet cover, which has easy snap closures. The price for this set is $149. DwellStudio makes two artistic peacock pattern duvet covers, the Peacock Citrine Duvet Set and the Peacock Dove Duvet Set. The Peacock Citrine Duvet Set features colorful turquoise peacocks perched among floral tree branches against a bright yellow background. This luxury duvet is made with 400 thread count cotton sateen fabric, with hidden button enclosures and French-back shams. The Peacock Dove Duvet Set features the same design as the Citrine set with a different color scheme. The peacocks are light brown against a white background and the trees have light blue foliage with small white and orange flowers. Both sets include the duvet and pillow shams and start at $310 for a queen. Overstock frequently carries peacock pattern duvet sets. As of 2012, you can find a cream colored duvet which features embroidered peacock feathers in bright blue, green and yellow. This pattern can be found in both queen ($69) and king ($79) sizes. The peacock is a symbolic image in many cultures. Not only is this beautiful animal revered for its amazing plumage, it is also associated with deity in cultures such as the Hindus, the Greeks and Romans, and is even considered a symbol for eternal life in Christianity. Peacocks are considered sacred in India and represent many of the most admired human traits such as integrity, loyalty, protection, nobility, royalty and guidance. Peacock patterned bedding not only provides a luxurious, upscale look to your bedroom, it may also carry some positive energy by design.